Moose Meat is delicious if you start your preparation in the field. After you shoot your moose you need to get all that moose meat back to your camp. Dragging your moose through miles of mud, swamps and gravel roads is not likely doing you any favours! As a matter of fact if you have already gutted your moose this may be the worst thing you could do. Gut and quarter your moose ready for transport. 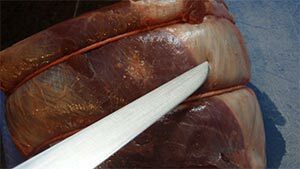 Use the gutless method and bone out your moose meat. Transport the moose whole (before gutting). Gut the moose, then transport it whole. This moose is about to embark on its journey to our truck. Are you back packing your game? Can you drive right up to the moose? Do you need to leave your animal out in the field overnight? How soon must you get you meat into a cooler? Is it cold enough to keep your meat at camp? Are you alone or do you have help? 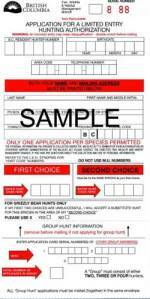 These are just a few of the important decisions you must make when dealing with wild game meat. Weigh out your individual circumstances and make up your mind which way is best for you. 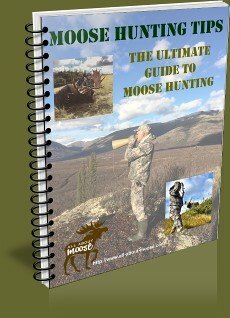 Got a question regarding Moosemeat? Skip down to the form at the bottom of the page and ask away. Here is an example: You shoot a moose within say, 200 to 300 meters of a road. If you are prepared and have enough rope with you we can assume you will attempt to drag your moose to the road in one piece. The challenge comes here: Between you and the moose lies a small beaver pond. Clean your moose before you drag it. Clean your moose after you get it out to the road. Cleaning will make the animal lighter... easier to pull. Dragging a moose by its hind legs is more streamlined than by its head, but this also means that the chest cavity will fill with bits and pieces of everything you drag it through. Sending your moose meat for a dip in a beaver pond is likely NOT the best advice as Giardiasis (beaver fever)lives there. If you wait until you drag your moose out to the road before you clean it, you will avoid a lot of meat contamination. 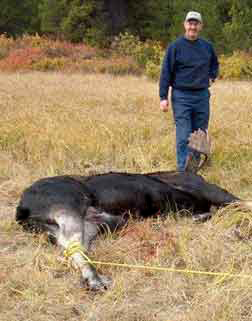 It will become a judgment call: how much time will it take you to retrieve your moose in one piece verses cleaning immediately, then either quartering and carrying and or doing a lot of extra cleanup to your moose meat. Caring for your moose in the field is very important if you are wanting good tasting table fair. You must also take the steps to prevent bone sour. Although we are experienced moose hunters this year we found ourselves smelling something rotten hanging from our game pole. Our group of hunters prefer, when practical, to move our moose close to the road before cleaning, it really makes a huge difference in the end when you get back to camp and your animal is really very clean to start your skinning. 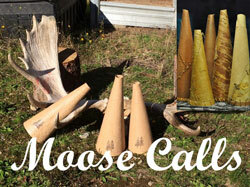 For more information about skinning moose please go to our moose skinning page. Once skinned it's time do decide if you should age moose meat. There are two methods of aging the meat and we prefer the dry age method. Lets compare 100 grams of ground mince from both moose and beef. Moose meat has 2 times the protein of beef too! It is a very healthy choice. Important Tip ....when cooking with moose meat. To reduce the chance of gamey flavor you should remove all fat and silver skin from the meat prior to cooking it. This is a sirloin tip moose roast and you can plainly see the silver skin. It really bugs me to have to use dull knives, so I broke down and bought a good set. I use Wusthof Knives for all my kitchen knives. The German made knives keep their sharp edge for long periods of time. A slight touch up with a steel now and then is all that is required to keep them razor sharp. I love these knives. They are a little pricey but well worth the investment. Here, I am cutting the silver skin off using a sharp boning knife. It is very important to use sharp knives when cutting meat and it makes the job a heck of a lot easier. A dull knife is a dangerous tool, invest in good quality knives for your meat cutting and skinning. The original roast with all the silver skin removed. I retied the roast using cotton butcher cord. Ready to cook! This really is the same roast, it looks different because of light exposure from my camera. No Stew It is important to note here: We use the round steak for stew meat. You might also consider processing your own meat. www.cabelas.com is a great resource center for every piece of equipment you may need. You might be wondering just how much moose meat are we talking about here? Well, we have one upright freezer dedicated for meat! Last year (2009) our largest moose field dressed at 692 pounds which I split with my hunting partner. This means the carcass without hide, head or entrails. Our family likes to get a half of a moose to last an entire year. With this much we have ample to share with all our relatives and friends. Do you enjoy eating moose meat? 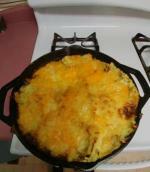 Moose recipes are something that we are all looking for, please share your recipes. It would seem that we humans are not the only ones that like to eat moose meat, wolves do too! Had an experience with a wolf? Got a picture of one? Tell us about it. We all like to see photos of wolves or hear about your wolf encounters. If you have one (story or picture) you would like to share with others please do so by clicking here. Got Questions about Moose Meat? What Is your question about moose meat? Do you have a question about moose meat? 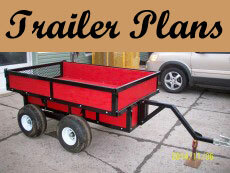 Maybe about cooking, storage or transportation for example? If Yes... Then ask it here! Do you know something about this subject? Yes... Then please share it here! Picture file size must be less than 100kb. The maximum image size accepted is 800x600 pixels. Can moose meat be refrozen after being thawed? Is slitting the throat of big game necessary? Is freshly killed moose meat good to eat?